There are certain images that are just iconic. You see them and they evoke a certain feeling or memory. Stockings are one of those iconic images. You see a stocking and it brings happy memories, fun, anticipation, and a bit of mystery. With the Holiday Stocking Kit you'll have a joyful time creating these projects, spending time with friends and enjoying an early start on the holiday festivities! These stocking projects are stuffed full of texture and fun sparkle and are sure to become works of art that you'll look forward to displaying year after year. And they make great gifts too! 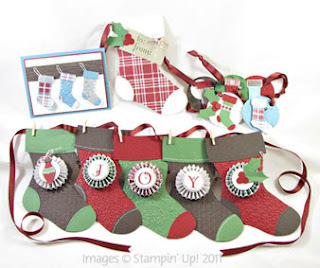 Projects include one stocking banner, one gift card holder/ornament; one card and 5 tags. Stamp Club Member? You save an additional 10% on the kit and stamp set(s). Kit is available to anyone in Canada, please add $9.95 for shipping if required. This is a great project to do with friends, order as many kits as you'd like and pay only $9.95 shipping. Then plan a girls night out to create these wonderful projects. These stocking theme projects feature the Big Shot, Holiday Stocking Bigz L Die, Stitched Stockings stamp set and coordinating Stocking Builder Punch to create a variety of iconic stocking images with rich colors and textures. With fun embellishments like Mini Jingle Bells, Mini Clothespins, Dazzling Details, Silver Glimmer Paper and the rich Quilted Satin Ribbon you are going to love what this holiday stocking has hidden away for you! All supplies marked with an * are included in the kit. All kit requests must be in and payment received by September 30th at which time supplies will be ordered. Kits will be ready for pick up/to be shipped mid October. Request your kit now. Please include: Name, address, email, whether shipping is required, number of kits, if you wish to add on any of the stamp sets, and if you are a stamp club member. I will send you your total and we will work out payment from there. Don't delay request your kit today!